Li Palatinati di Minsk, Mscislaw, Polok, e Witebsk Nella Littuania. 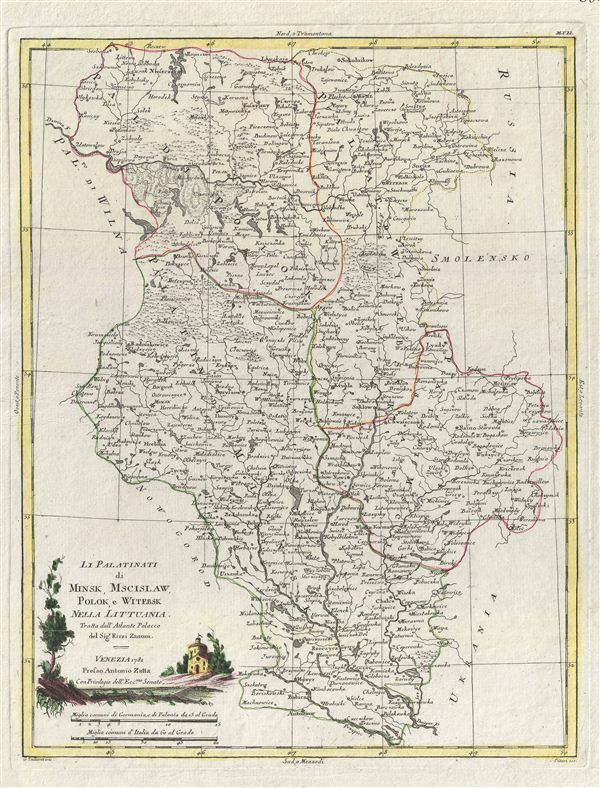 A fine map of the Palatinates of Minsk, Mscislaw, Polok and Witebsk, Poland. This map covers from parts of Poland from Sokolnikow to Plost and from Wilna to the Russian border. Though culturally intact, by 1781 Poland had gone through two partitions. When this map was issued most of the territory depicted here was under Russian suzerainty. A title cartouche depicting a country scene set in the lower left quadrant. This map was drawn by Antonio Zatta for Rizzi Zanoni's 1781 Atlante Polacco. Antonio Zatta (1775-1797) was the most prominent Italian map publisher of the late 18th and early 19th century. His firm, based in Venice, produced maps that mark an important transition from 18th to 19th century cartographic styles. He updates and redefines the traditional title cartouche by replacing the mythic elements common to the 17th and 18th century with more representative images. He maps also strive to keep many 18th century details, such as figural depictions on the map itself, while striving for the accuracy that a 19th century clientele demanded. His most important work is the four volume Atlante novissim published from 1775 to 1789. Zatta, A., Atlante Polacco, (Venice: Rizzi Zannoni) 1781.